This book is making huge strides for me. Not from a plotting point of view, but from a storytelling point of view. 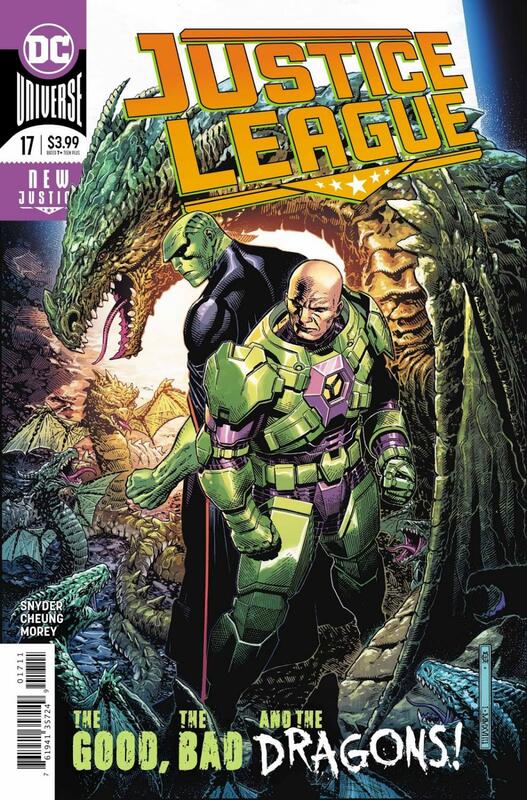 Last week saw possibly the most incredible event to happen in the DCU in the last few years… but this issue slows things down and we have an issue focusing on Martian Manhunter and Lex Luthor. I really do love everything about that sentence, and I think the slow pace felt needed after last issue's massive ending. The way that Scott Snyder and Jim Cheung visualised this whole issue as one seemingly fueled by classic western scenery made it all the better as I love westerns so much. The first page is so beautifully plotted and laid-out and got me very excited. Cheung brings a level of detail and scope to his stories that few modern artists can. I'd love to see more of his work in this book but he simply can't pull of a monthly schedule, let alone pulling off a biweekly one. He just isn't given much to do here, though. The detail that he and inkers Mark Morales and Walden Wong inject into the story complement Tomeu Morey's very strong colouring in a really vibrant way. Morey in general makes very strong colouring choices and they result in beautiful pages, most notably the final page, with his contributions feeling a lot more subtle but still powerful. Scott Snyder more or less changes everything we know about Lex Luthor's childhood, and I didn't mind the change. It made enough sense and it should give him a few more dimensions going forward, casting doubt on his whole mission of doom. The scope of this story is only going to get bigger and bigger as the issue count gets higher, so I was really impressed with Snyder's choice to take this scope and narrow it down to J'onn and Lex. Firstly, I'm glad that J'onn is front and centre of this book. It feels right, and he's one of the cornerstone characters of the DCU. By establishing and focusing on this relationship, the dynamic between the Legion of Doom and the Justice League feels more personal and heavy with stakes amid the cosmic chaos of Perpetua and the Source Wall. I had a great time with this issue. Slowing things down after a huge event normally wouldn't sit right with me but it's handled with class and tension and tight storytelling so I wasn't mad at this issue at all. Snyder throws a wrench into the perfect mind of Lex Luthor and I genuinely can't wait to see how it plays out.